Buffalo Creek Brewing Turns One and Celebrates in Historic Style! People can take a step back and relax while enjoying a few cold ones in the company of one another. 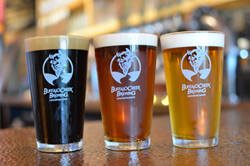 In celebration of its first year serving hand-crafted beer inside its Bavarian-themed taproom, Buffalo Creek Brewing located in historic downtown Long Grove is throwing a birthday bash for the ages. Beer, BBQ and/or Bluegrass fans alike are cordially invited to discover the meaning of “Muttersholtz” on Saturday, July 21st. From noon to 10 pm, owner/brewmaster Mike Marr is transforming his lauded brewery and its expansive outdoor grounds and parking lot into Muttersholtz Fest – an anniversary party in honor of Long Grove’s roots. So why Muttersholtz Fest? Marr explains: “It’s a bridge between Long Grove’s deep-seated immigrant history and the environment I’m trying to create today.” At the anniversary event, Marr is pulling out all the stops. Included in the price of admission (tickets are now available on EventBrite) is a heaping plate of BBQ highlighted by three of the area’s leading barbecue chefs competing for the title of best whole-roasted hog on a spit, non-stop live music by four topnotch bluegrass bands, and choice of ice cold beer from Buffalo Creek Brewing’s extensive menu. To further demonstrate his commitment to the local community, Marr is also donating a percentage of the proceeds raised at Muttersholtz Fest to the Long Grove Lions Club. The original settlers of Long Grove emigrated from the small town of Muttersholtz (“Mother’s Wood” in English) in the mid 1800’s, and originally named it after their ancestral home, which was part of Germany at the time. Legend has it that they picked the area because the “Long Grove” of trees reminded them of the terrain back home. The original postmaster in town, a man by the name of Sigwalt, is credited with first registering the name. However, as time went on the residents desired an English name, so Long Grove was chosen.